I think just about any woman will say that they love to shop. Whether it’s online, or in a physical store. When I was pregnant with my daughter, all I did was shop. Every weekend, every payday I would spend hours at a time on State Street & Michigan Ave here in Chicago shopping the latest deals and new arrivals for items that I would probably never wear. There was something so relaxing about getting off from a long day of work and relaxing with a little retail therapy. I didn’t realize that I was overspending, or had a shopping problem. Until after giving birth I had nothing to wear. My wardrobe was full of super trendy pieces that didn’t fit my new life as a mom or even my personal style. But, there is just a rush that I got and still get when I shop. The more my shopping cart fills up the happier I get, the more anxious I got. Looking back, the rush that I got, the need to add new items into my wardrobe every week was coming from a place of lack, and my own self therapy of retail therapy. I know this isn’t the case for everyone, this is just my story on why in the past I got so much pleasure from spending more than I really needed to. After awhile, it got to the point where I was spending more money than I was saving and I was accumulating things because I thought those things validated me. What are you trying to avoid, or why do you overspend? This year and beyond I having been challenging myself, to first create a fun budget exclusively for clothes. Doing this a few years ago would have probably been a bit crazy to me. It took me to understand that I was trying to avoid the pressures of being a soon to be mom. Not only that, but working in the fashion industry, I also felt the pressure of wanting to look good when I go to work or anywhere for that matter. If you find yourself in the same situation I was in. I recommend getting to the root of why you overspend and find out what you’re trying to avoid. Are you shopping just because you have extra money to blow? Are you shopping because you just can’t stop! Who’s been there even if it’s not clothes those random Amazon orders that you find yourself placing because you swear you need a cup warmer and gold pens for your desk ( HA! I’m Guilty again). Sometimes we just shop out of boredom and by boredom I mean you’re probably tired of wearing the same ole clothes. In order to navigate through this boredom, I recommend grabbing your favorite magazine and Pinterest images and get inspired. Create new outfits, try things you never would have tried before. 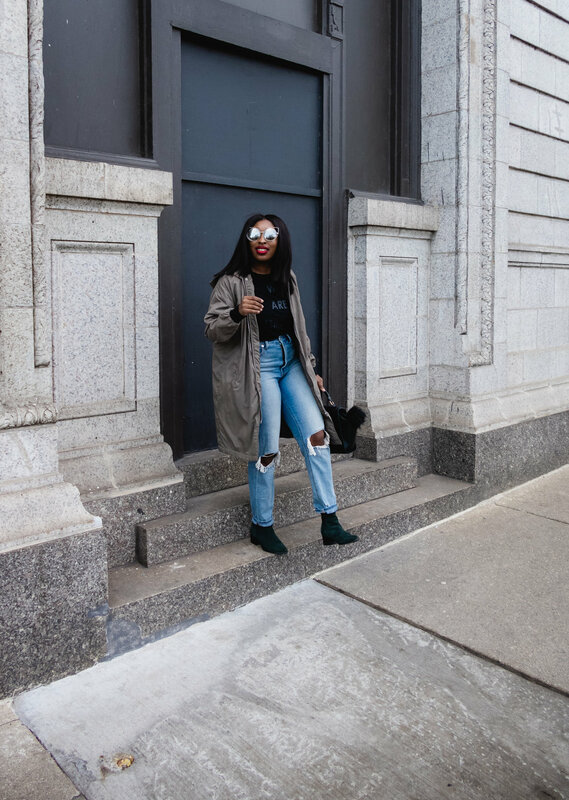 Although this post is about how I plan my fall wardrobe, I really suggest reading it, because I share with you my process on how I refine, & edit my wardrobe. As you are being mindful of your shopping habits and managing your budget, I recommend challenging yourself to not spend a dime at all. You can start off by allocating all of your expenses for the week, by leaving the house without your debit cards maybe carry emergency cash and not spend. For each day that you do not shop put $5-$20 into a fun clothing allowance. This is a fun challenge that will teach you to be more disciplined but also mindful of your money. You will learn how to work with what you have and better understand your wardrobe. While allowing you to develop an intensive wardrobe shopping list, to spend the money you saved over the challenge. Tell me, what are some of your favorite ways to stop overspending?